T-L Photo/SETH STASKEY OHIO STATE head football coach Urban Meyer (left) announced his retirement from coaching during a press conference Tuesday afternoon in the Fawcett Center on the OSU campus. 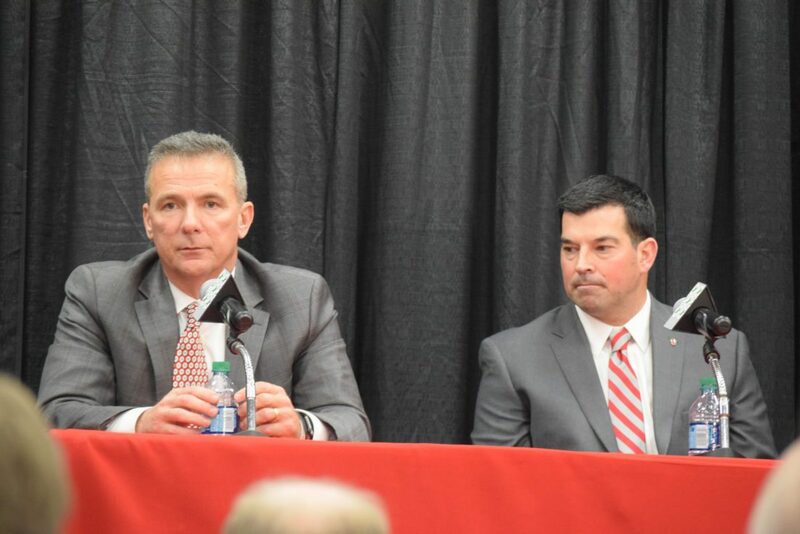 Ohio State Athletics Director Gene Smith announced, during the same news conference, that current offensive coordinator Ryan Day (right) was being hired as the 25th head football coach in Ohio State’s history. COLUMBUS — It really doesn’t matter which tangible piece of evidence you consider when it comes to measuring the success of Urban Meyer’s coaching career. The results are off the chart. Whether it’s the 2014 national championship, conference titles, utter dominance of Michigan, his 82-9 record or the things such as graduation rates and preparing his players for life after football, Meyer posts high marks. In just seven years, Meyer officially etched his name into upper echelon of all-time great coaches at Ohio State University. He’s definitely in the conversation with the likes of Woody Hayes and Jim Tressel. But, often times, coach’s legacy runs deeper than that. Meyer’s legacy not only with the Buckeyes, but overall in coaching, was a highly talked about topic Tuesday after he announced his retirement from coaching, effective after the Rose Bowl Game against Washington on New Year’s Day. At that time, Ryan Day will ascend to the role of head coach after he signed a five-year contract valued at $22 million. There’s no doubt in my mind that his football program represented the university and the state of Ohio well, but again, the legacy contains more than any on-field success. And his OSU legacy probably would have never been called in question if it weren’t for this past summer. It was determined that Meyer mismanged former wide receiver coach Zach Smith after Smith was alleged to have been involved with domestic violence. No charges were ever filed against Smith, but his status with the Buckeyes’ coaching staff remained basically unchanged. That drew the ire of many, and rightfully so. Because of that, Meyer was suspended from all of training camp and the first three games when Day filled in as the interim head coach and guided the Buckeyes to win s over Oregon State, Rutgers and TCU. Because of that incident, right or wrong, Meyer’s Ohio State legacy was forever changed in the minds of many. As it pertains to NCAA rules and the like, Meyer has always done it the right way. If you’re talking about caring and looking out for his players, again, Meyer checks all of the boxes. And clearly, there should be something said for that because it’s a major part of coaching, especially in amateur ranks when you’re dealing with — in essence — kids. Those players — whether it was at OSU, Bowling Green, Utah or Florida — have always been the most important thing to Meyer. And the way at which the Buckeye players handled all of the adversity this season to put forth a 12-1 record, win a second consecutive Big Ten championship and earn yet another New Year’s Six Bowl bid, tells you that Meyer and his staff recruited really good players and they never lost faith in their head coach. Meyer earned that faith from all of his players because of how treated them. As he pointed out, he made it a point to learn as much about his players, and their families, as he possibly could. Much of Meyer’s beliefs, systems, traditions and legacy items will actually continue even after his tenure comes to close in less than a month. Day, who has been part of the Buckeyes program for the last two years as quarterbacks coach and offensive coordinator, realizes what Meyer has done at Ohio State doesn’t need much tweaking. Though Meyer’s personal legacy may have a bit of a tarnish on it, the Buckeyes football program is like a freight train and, quite simply, Day is trying to keep it on track. It was reported that he’s already decided he’s retaining many of the foundational pieces like strength coach Mickey Marotti, director of Recruiting Mark Pantoni and some other key personnel pieces who actually came when Meyer was hired. Those are important cogs in the success. Meyer has not only re-energized Ohio State, but the entire Big Ten. The football program is clicking on all cylinders and there’s no reason to believe that will change anytime soon. WHILE DAY and the other OSU coaches are on the road recruiting this week and part of next as the early signing period quickly approaches, Meyer will be in his office at the Woody Hayes Center preparing the current Buckeyes for their game against Washington. MEYER, who indicated this is his final coaching job, admitted he plans to remain visible at Ohio State and Athletics Director Gene Smith indicated he wants Meyer to remain involved at Ohio State in some capacity. DAY is just 39 years old, which is three years older than Meyer when he was hired at Bowling Green for his first head coaching position. Obviously, BG isn’t OSU as it pertains to football. Not counting Luke Fickell, who served as the head coach after Tressel and before Meyer for one season, Ohio State last hired a head football coach with no head-coaching experience in 1946. It doesn’t seem to intimidate Day, whatsoever. “The footprint that Coach Meyer has left here and the infrastructure is strong, so knowing that and being here for two years and seeing exactly how it’s been done gives me great confidence,” Day said.